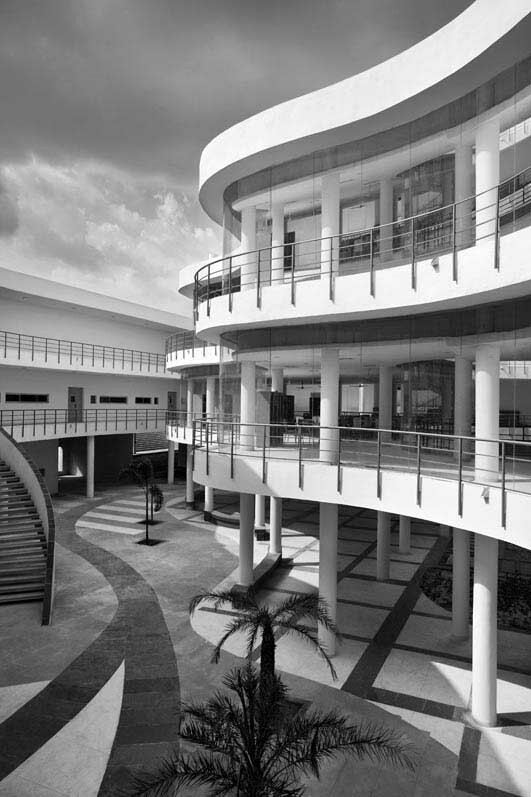 The Pearl Academy of Fashion, Jaipur is one of the first educational institutes in India to address both cost and environmental design as its primary goals. The architectural parti consists of a range of multifunctional spaces which are a seamless blend of the interiors and exteriors. Many elements of this thermally adaptive environment borrow from the tradition of passive cooling techniques prevalent in the hot-dry desert climate of Rajasthan. Passive climate control methods reduce dependence on expensive mechanical cooling and heating methods in a state with scarce energy resources. The design reinterprets two traditional Rajasthani architectural motifs: the stone screen known as the “jaali” and the open-to-sky courtyard. The jaali, traditionally used to screen private spaces and modulate light within buildings, is re-imagined as an exterior skin; placed four feet away from the wall and acts as a thermal buffer. The density of the screen has been derived using computational shadow analysis based on orientation of the façades. 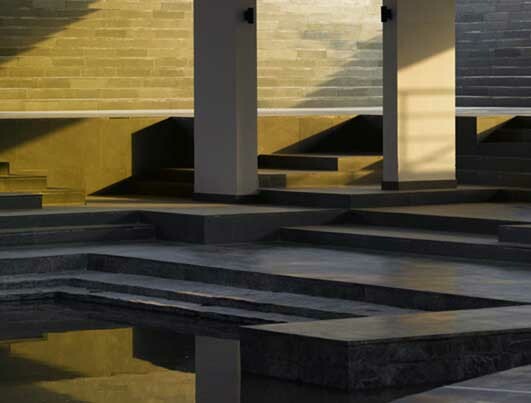 Courtyards take on undulating shapes within the regulated form of the cloister-like periphery and help control the temperature of internal spaces and open step-wells, while allowing sufficient day lighting inside studios and classrooms. The entire building is raised above the ground, creating sunken courtyards reminiscent of medieval stepped wells. This scooped out “underbelly” with a large pool acts like a natural thermal sink and serves as a large recreation and exhibition zone. 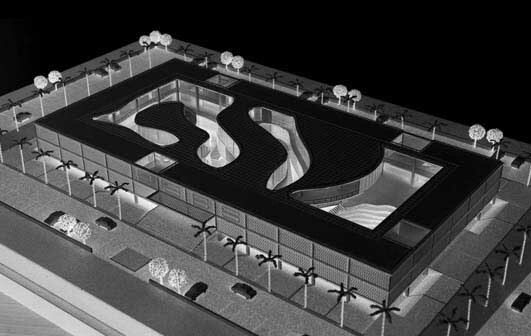 The pool, fed by the recycled water helps in the creation of a microclimate through evaporative cooling. Passive environmental design helps achieve temperatures of about twenty degrees lower than the outside temperature, when it reaches 47 degrees Celsius during the height of summer. 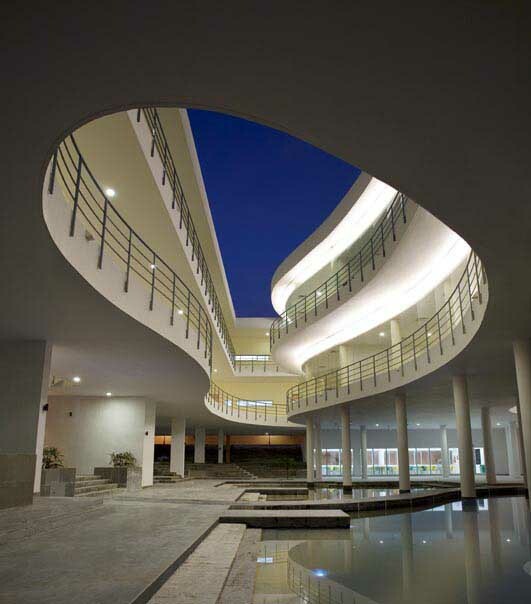 While the institute has become a successful model for cost-effective passive architecture in desert regions, the design and facilities of the campus complement the ideology appropriate to a fashion institute that seeks a global presence. 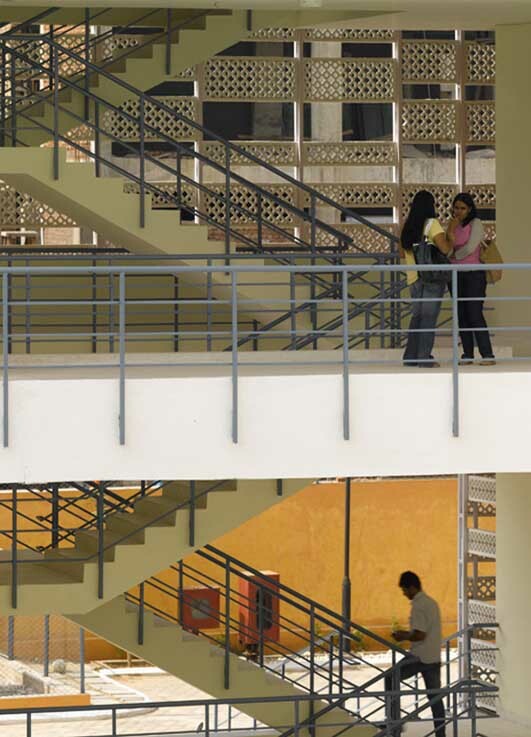 The Pearl Academy of Fashion, Jaipur is designed as a low cost, environmentally sensitive campus, first of its kind in India. The design creates a series of multifunctional spaces which blend the indoors with the outdoors seamlessly. Many elements of this thermally adaptive environment borrow from the tradition of passive cooling techniques prevalent in the hot-dry desert climate of Rajasthan. Environmental design is also employed as a strategy to lower energy costs in the long run. Passive climate control methods reduce/eliminate the dependence on expensive mechanical cooling and heating methods in a state with scarce resources. The design takes two almost inviolable Rajasthani architectural motifs and gives them a contemporary twist: the stone screen known as the “jaali” and the open-to-sky courtyard. 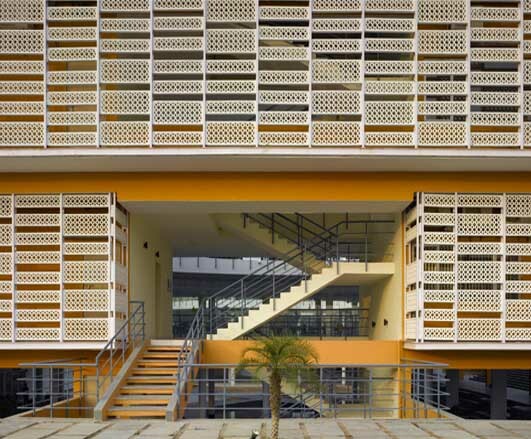 A double skin based on the ‘jaali’ acts as a thermal buffer between the building and the surroundings. 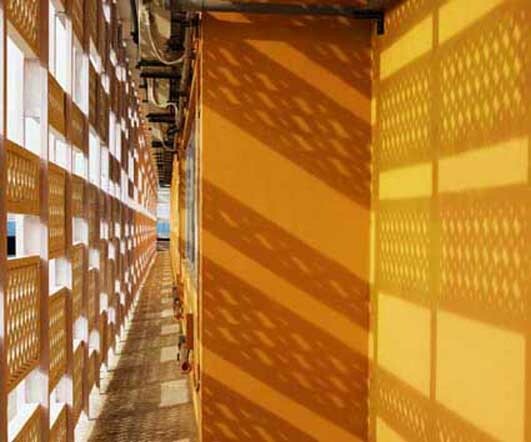 The density of the perforated outer skin has been derived using computational shadow analysis based on orientation of the façades. The screen situated four feet away from the wall reduces the direct heat gain. Drip channels running along the inner face of the screen allow for passive downdraft evaporative cooling, thus reducing the incident wind temperature. The traditional courtyards take on amorphous shapes within the regulated form of the cloister-like periphery. 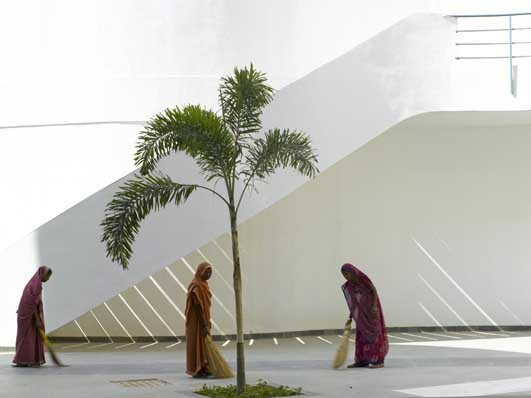 The shaded courtyards help control the temperature of internal spaces and open step-wells, while allowing sufficient daylighting inside studios and classrooms. The entire building is raised above the ground. The resultant scooped-out underbelly forms a natural thermal sink by way of a water body. The water body which is fed by the recycled water from the sewage treatment plant helps in the creation of a microclimate through evaporative cooling. This underbelly, which is thermally banked on all sides, serves as a large recreation and exhibition zone. Passive environmental design helps achieve temperatures of about 27 degree Celsius inside the building even when the outside temperatures are at 47 degree Celsius. During the night, when the desert temperature drops, this floor slowly dissipates the heat to the surroundings, keeping the area thermally comfortable. Materials such as local stone, mosaic flooring with steel, glass and concrete help meet the climatic needs of the region while retaining the progressive design intent, keeping in line with the aims of the institute. It promotes rainwater harvesting and wastewater re-cycling through the use of a sewage treatment plant. 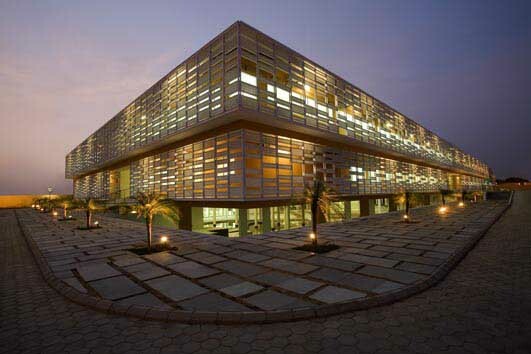 While it has become a successful model for cost-effective passive architecture in desert regions, the design and facilities of the campus complement the ideology of the Pearl Academy of Fashion – a cutting edge design institute with a sustainable approach.